Comma head coating is the most common form of coating in the industry today. In this video, Senior Processing Engineer Mike Rothaupt demonstrates how our comma head coater works. He also explains the advantages and disadvantages of comma head coating. Watch the video below to learn more about our coating systems. [Transcript] "Hi, my name's Mike. 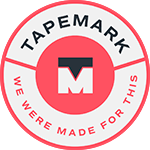 I'm a senior processing engineer here at Tapemark. And today I'm going to discuss the advantages and disadvantages of comma head coating. So this is the comma head that we have here at Tapemark. While it's in operation, you're coding substrate comes through the bottom on this roll. Then once in motion it passes through a coding trough, which would be attached to the bottom here, which is holding your blend. The blend is pulled up to the middle here where it contacts the comma head, which then meters it to the thickness that you're targeting. The advantages to this method are mainly that it's fairly intuitive in its operation. The coding thickness is just controlled by moving the comma head up and down, so the setup is relatively simple. The disadvantage is that your blend is exposed to the environment a little bit while it's in the coding trough, so there are possibilities of solvent loss. You can mitigate that by having your trough covered, but it's still a risk that you have to deal with. You also because the one is getting pulled through by the release liner and then wipes at the comma head. Any variation in either your release line or thickness or quality of the release coating will change how it's sheared as it goes through the comma head and you will see variation in your coding thickness because of that. So you just have to be mindful of that while you release liners. It’s more important for this method than if you're doing slot die coating."